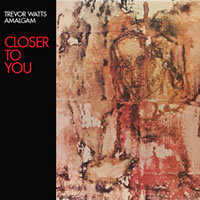 Recorded in May, 1978, this reissue of Closer to You features saxophonist Trevor Watts, electric bassist Colin McKenzie, and drummer Liam Genockey in a set marked by a dynamic mix of free-wheeling raucous energy and a more somber, almost mournful atmosphere. Watts’ Amalgam gets out of the gate like a rocket ship on the opener, “De Dublin Thing.” His careening, wild alto saxophone is a vehicle of nearly unbridled spirit, and while his overblowing may not be for everybody, it does add to the urgency and immediacy of his playing. Genockey gets all over his kit, and McKenzie propels the trio while setting up his drummer for a number of hits and fills. “South of Nowhere” begins in a quieter mode that’s free of time, with Watts’ lamentations giving way to a groove. After a decrescendo that ends in near silence, McKenzie jumpstarts a whimsical march that sets the foundation for Watts’ playful Braxtonish excursions. The album’s centerpiece is the nearly twenty-minute “Dear Roland” – ostensibly for Roland Kirk, given his death a year earlier and Watts’ simultaneous playing of alto and soprano. As on “South of Nowhere” the trio begins in a soft, sparse, and darker mood which is occasionally interrupted and augmented by alto/soprano screeches, gongs, and tom rumbles. Watts plays a three note motive that McKenzie immediately echoes and transforms into the basis for a groove, which the trio explores for several minutes before fading and returning to the opening framework. The piece’s narrative arc and varied sonic textures make for an engaging conclusion to the original album. This reissue also includes five previously unreleased bonus tracks. As before, Watts, McKenzie, and Genockey absolutely get after it. “Albert Like” has a weird, almost funky r&b feel over which Watts blows a series of catchy earworm hooks – that is until the cut abruptly ends, as if the tape ran out. The freely improvised “Bottle Alley” – which doesn’t quite have as much purpose as the other selections – has an audible tape hiss. And while the rocking, uptempo burner “Mad” scintillates, the intensity of the album’s original four tracks make what comes after almost too much. Bonus tracks or no, this new version of Closer to You – even in its quieter moments – hits fast and hits hard.